KENNEDY SPACE CENTER, FL – After postponing last week’s liftoff of the covert ‘Zuma’ spy satellite due to last minute concerns about the reliability of the payload fairing encapsulating it while poised for liftoff at KSC pad 39, SpaceX is set to at last resume launches from their previously damaged and now repaired Cape Canaveral pad 40 with a cargo resupply mission for NASA to the International Space Station (ISS) on Dec 4. NASA and SpaceX have jointly decided to move forward with the Dragon CRS-13 cargo blastoff apparently because the mission does not involve use of the problematical payload fairing that halted last weeks planned Falcon 9 launch with the rocket and the mysterious Zuma payload. Zuma was ready and waiting at pad 39A for the GO to launch that never came. Then after a series of daily delays SpaceX ultimately announced a ‘stand down’ for super secret Zuma at pad 39A on Friday, Nov. 17, for the foreseeable future. SpaceX engineers also had to deal with the after effects of a fire that broke out on a Merlin engine test stand during preparations for a hot fire test that resulted from a leak during a ‘LOX drop’ that halted testing of the Block 5 version of the Merlin 1D. Since SpaceX’s gumdrop shaped Dragon cargo freighter launches as a stand alone aerodynamically shielded spacecraft atop the Falcon 9, it does not require additional protection from atmospheric forces and friction housed inside a nose cone during ascent to orbit unlike satellites with many unprotected exposed surfaces, critical hardware and delicate instruments. Thus Dragon is deemed good to go since there currently appear to be no other unresolved technical issues with the Falcon 9 rocket. “NASA commercial cargo provider SpaceX is targeting its 13th commercial resupply services mission to the International Space Station for no earlier than 2:53 p.m. EST Monday, Dec. 4,” NASA announced on the agency blog and social media accounts. The Dec. 4 launch date for Dragon CRS-13 was announced by NASA’s space station manager Dan Hartman during the Orbital ATK Antares/Cygnus launch campaign that culminated with a successful blastoff last Sunday, Nov 12 from NASA’s Wallops Flight Facility on Virginia’s eastern shore. But the targeted Dec 4 liftoff from Space Launch Complex 40 on Cape Canaveral Air Force Station, FL, was cast in doubt after SpaceX disclosed the payload fairing issue related launch delay on Friday. Since last week SpaceX engineers have been busy taking the time to carefully scrutinize all the pertinent fairing data before proceeding with the top secret Zuma launch. “We have decided to stand down and take a closer look at data from recent fairing testing for another customer,” said SpaceX spokesman John Taylor last Friday. All of SpaceX’s launches this year from Florida’s Spaceport have taken place from NASA’s historic Launch Complex-39A at the Kennedy Space Center. Pad 39A became SpaceX’s only operational Florida Space Coast launch pad following a catastrophic launch pad accident last year on Sept. 1, 2016 that took place during a routine fueling test that suddenly ended in a devastating explosion and fire that completely consumed the Falcon 9 rocket and Amos-6 payload and heavily damaged the pad and support infrastructure. Since the Amos-6 accident workers raced to finish refurbishments to NASA’s long dormant pad 39A to transform into operational status and successfully launched a dozen missions this year. Simultaneously additional crews have been hard at work to repair damaged pad 40 so that flights can resume there as soon as possible for the bulk of NASA, commercial and military contracted missions. Meanwhile SpaceX wants to upgrade pad 39A to launch the Falcon Heavy and crewed Dragon flight. But those launches cant take place until pad 40 resumes operational status. The Dragon CRS-13 mission was recently announced as the maiden mission for the reopening of pad 40. Altogether Dragon CRS-13 will count as the fourth SpaceX Dragon liftoff of 2017. The 20-foot high, 12-foot-diameter Dragon CRS-13 vessel will carry about 3 tons of science and supplies to the orbiting outpost and stay about 4 weeks. It will be a reused Dragon that previously flew on the CRS-6 mission. “The Dragon [CRS-13] spacecraft will spend about a month attached to the space station,” NASA said. The prior Dragon CRS-12 resupply ship launched from pad 39A on Aug. 14, 2017 from KSC pad 39A and carried more than 6,400 pounds ( 2,900 kg) of science experiments and research instruments, crew supplies, food water, clothing, hardware, gear and spare parts to the million pound orbiting laboratory complex. Dragon CRS-9 was the last ISS resupply mission to launch from pad 40 on July 18, 2016. The recently arrived Orbital ATK Cygnus cargo ship is expected to depart the station from the Earth facing Unity node on Dec. 3 to make way for Dragon’s berthing at the Harmony node. 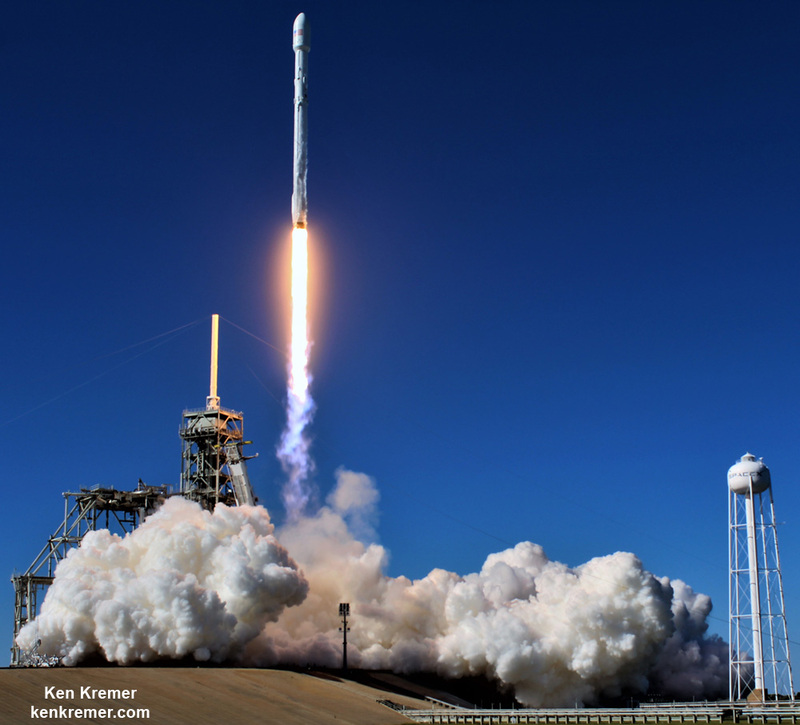 Watch for Ken’s continuing onsite coverage of SpaceX CRS-13, Zuma and KoreaSat-5A & Orbital ATK OA-8 Cygnus and NASA and space mission reports direct from the Kennedy Space Center and Cape Canaveral Air Force Station, Florida. KENNEDY SPACE CENTER, FL – Liftoff of the clandestine spy satellite codenamed ‘Zuma’ on a SpaceX Falcon 9 rocket has been postponed indefinitely to resolve a lingering issue with the testing of a payload fairing for another customer. SpaceX announced today, Friday, Nov 17, that they will ‘stand down’ to allow engineers the additional time needed to carefully scrutinize all the pertinent data before proceeding with the top secret Zuma launch. “We have decided to stand down and take a closer look at data from recent fairing testing for another customer,” said SpaceX spokesman John Taylor. The super secret ‘Zuma’ spysat is a complete mystery and it has not been claimed by any U.S. government entity – not even the elusive NRO spy agency ! The NRO does claim ownership of a vast fleet of covert and hugely capable orbiting surveillance assets supporting US national security. Zuma’s goals are veiled in virtually complete darkness. And as far as the taxpaying public is concerned its ownerless. Originally scheduled for Wednesday evening at 8 p.m. EST Nov 15, the Zuma launch from the Florida Space Coast had already been postponed twice this week before today’s decision to called it off indefinitely. The initial 24 hour delay to Thursday was to deal with unspecified ‘mission assurance’ issues. The second days delay to Friday was pinned more specifically on the payload fairing or nose cone. SpaceX has also had to deal with an engine testing problem that caused a fire on a test stand while preparing to hot fire a Block 5 Merlin 1D engine at their Texas facility on Nov. 4. It is not known if this was part of the ‘mission assurance’ issues. No new targeted launch date has been announced. “Though we have preserved the range opportunity for tomorrow, we will take the time we need to complete the data review and will then confirm a new launch date,” Taylor stated. SpaceX had been planning an ambitious launch campaign of 4 or more launches by the end of this year – including the maiden launch of the triple barreled Falcon Heavy. That seems very unlikely now. Just exactly what the fairing problem is has not been disclosed. Its also not known if the two delays are related or not. The fairing is jettisoned three minutes after liftoff. Any failure to deploy would result in a total loss of the mission. 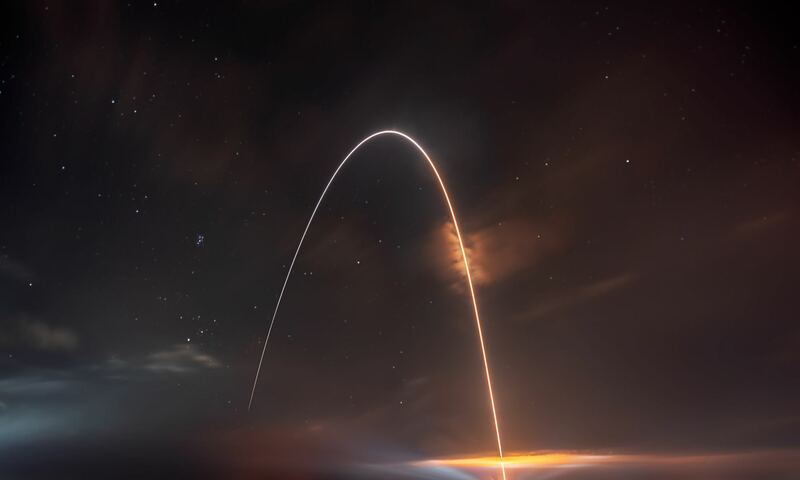 Zuma was to roar off seaside Launch Complex 39A at NASA’s Kennedy Space Center in Florida during a lengthy two hour launch window that extended from 8 to 10 p.m. each targeted day this week. The Eastern range had been reserved by SpaceX for a potential Saturday launch opportunity as well. However all mention of the Zuma launch has now been deleted from the website of the 45th Space Wing at Patrick Air Force Base, FL. Forecast weather conditions in central Florida were near perfect over the past few days and spectators would have witnessed a dazzling sky show as the two stage 229-foot-tall (70-meter-tall) Falcon 9 soared to orbit. One of the few tidbits we can confirm is that the launch contract was arranged as a commercial enterprise under the auspices of Northrop Grumman Corporation – as a means to significantly slash launch costs for whatever U.S government entity is responsible for Zuma. But the launch was only publicly announced 1 month ago in mid October and it suddenly appeared on the SpaceX launch manifest after an FAA launch license was granted. We don’t know anything about the ‘Zuma’ payloads characteristics and vital statistics – despite the seemingly endless leaks streaming out of Washington these days. The only clue to its goals to be revealed is the intended orbit. Low Earth Orbit extends to roughly 1200 miles altitude and includes the ISS orbit for example at approx. 250 miles. On Friday evening the rocket was lowered to the horizontal position on the transporter erector on pad 39A. It will be rolled back to the processing hangar outside the perimeter fence for further engineering evaluation. Whenever the launch is rescheduled SpaceX will attempt to recover the 16 story tall first stage booster with a soft landing on the ground back at Cape Canaveral Air Force Station. So expect some extremely loud sonic booms to rock the space coast region about eight minutes after liftoff. KENNEDY SPACE CENTER, FL – Amidst the frenzy of ‘Sunshine State’ preparations for Cat 5 monster Hurricane Irma and quite dismal weather favorability odds, the skies surrounding the Florida Space Coast suddenly parted just in the nick of time enabling the Air Force’s secret military X-37B spaceplane to blast off this morning (Sept. 7) on a SpaceX Falcon 9 as the booster nailed another thrilling ground landing back at the Cape. The SpaceX Falcon 9 roared to life at 10 a.m. EDT (1400 UTC) Thursday morning and soared aloft from seaside Launch Complex 39A on NASA’s Kennedy Space Center into nearly clear blue skies after the classified launch time was kept guarded until just 10 minutes before liftoff. Due to the potential for catastrophic destruction from approaching Hurricane Irma this was the last chance for the X-37B to escape Florida to orbit before the Kennedy Space Center and Cape Canaveral Air Force Station almost certainly close on Friday, the backup launch opportunity. The X-37B OTV spaceplane reached orbit as planned on SpaceX’s 13th launch of the year. “The 45th Space Wing successfully launched a SpaceX Falcon 9 launch vehicle Sept. 7, 2017, from Kennedy Space Center’s Launch Complex 39A,” the USAF and 45th Space Wing confirmed in a post launch statement. The Falcon 9 launch was absolutely gorgeous taking place under near perfect weather conditions at launch time and putting on a long sky show as the rocket accelerated to orbit with its precious cargo. The nine Merlin 1D first stage engines ignited to generate a combined 1.7 million pounds of thrust fueled by liquid oxygen and RP-1 propellants, sending a huge exhaust plume billowing from behind as the rocket ascended off pad 39A and thundered aloft. After first stage burnout and main engine cutoff the stages separated at T plus 2 min 26 seconds. After successfully delivering the secret USAF mini-shuttle to orbit, SpaceX engineers completed the 2nd half of the double headed space spectacular when the Falcon 9 first stage booster successfully made a guided soft landing back at Cape Canaveral Air Force Station (CCAFS). The boosters high speed descent generated multiple shockingly loud sonic booms as the 156-foot-tall first stage approached SpaceX’s dedicated Landing Zone-1 (LZ-1) on CCAFS that reverberated for dozens and dozens of miles across and beyond the Space coast region. The mid-morning daylight first stage precision guided landing offered spectators a magnificent up close view of the rocket reusability technology envisioned by SpaceX’s billionaire CEO Elon Musk to drastically slash the high costs of launching people and payloads to space. Meanwhile, Hurricane Irma continues barreling towards Florida packing winds of 185 mph as one of the strongest Atlantic storms ever. It is being closely tracked in incredibly high resolution by the new NASA/NOAA GOES-16 (GOES-R) satellite launched late last year on a ULA Atlas V in Nov 2016. The X-37B reusable mini-shuttle is a secretive technology testing spaceplane flying on its fifth mission overall for the U.S. Air Force Rapid Capabilities Office. “The OTV is designed to demonstrate reusable spacecraft technologies for America’s future in space and operate experiments, which can be returned to and examined on Earth,” said the USAF. Also known as the Orbital Test Vehicle, the X-37B launched on the OTV-5 mission marks the programs maiden liftoff on the 230-foot-tall SpaceX Falcon 9. All four prior OTV missions launched on the United Launch Alliance Atlas V and ended with runway landings in either California of Florida. The X-37B launches vertically like a satellite but lands horizontally like an airplane and functions as a reliable and reusable space test platform for the U.S. Air Force. The Boeing-built X-37B is processed for flight at the Kennedy Space Center, FL, using refurbished former NASA space shuttle processing facilities (OPFs) now dedicated to the reusable mini-shuttle, also named the Orbital Test Vehicle (OTV). The last blastoff of the X-37B took place more than 2 years ago on May 20, 2015 when the OTV-4 mission launched on a ULA Atlas V on May 20, 2015 from Space Launch Complex-41 on Cape Canaveral Air Force Station. After spending a record setting 718 days in orbit, the X-37B vehicle completed its fourth mission with a runway landing back at KSC’s Shuttle Landing Facility earlier this year on May 7, 2017. Overall the OTV unmanned spacecraft have spent a total of 2,085 days in orbit. The 11,000 pound (4990 kg) state-of-the art reusable OTV space plane is about a quarter the size of a NASA space shuttle. The vehicle measures 29 ft 3 in (8.9 m) in length with a wingspan of 14 ft 11 in (4.5 m).